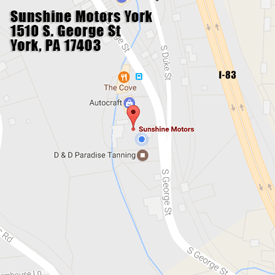 Sunshine Motors Buy Here Lease Here York PA offers a warranty on all cars, including the engine, transmission and 4×4 (if included) the entire time you are paying on it. Your vehicle also comes with a maintenance package which includes an oil change, checking and topping off all fluids (except gas) and inspecting the brakes & exhaust. This takes place at The Service Center at 1512 South George Street and should be done every 3,000 miles or 3 months. The warranty and maintenance package is included in your weekly, biweekly or monthly payment. All vehicles are inspected and emission tested at the time of purchase. There is a $500 deductible on any major repairs on the Motor & Transmission and the rest is covered. If any major repairs need to be done to get your vehicle back on the road, financing options are available so that you can keep driving! Check out our About page to view a short video on how all of this works! Here at Sunshine Motors we offer a very beneficial Referral Program. If you refer someone to Sunshine Motors and they buy a car, you will receive a $100 referral fee! Fill out a Financing Application today!